The Gateway Pundit continuously publishes unverified and wrong information, but the Alabama Senate candidate’s wife still shares its articles about her husband. 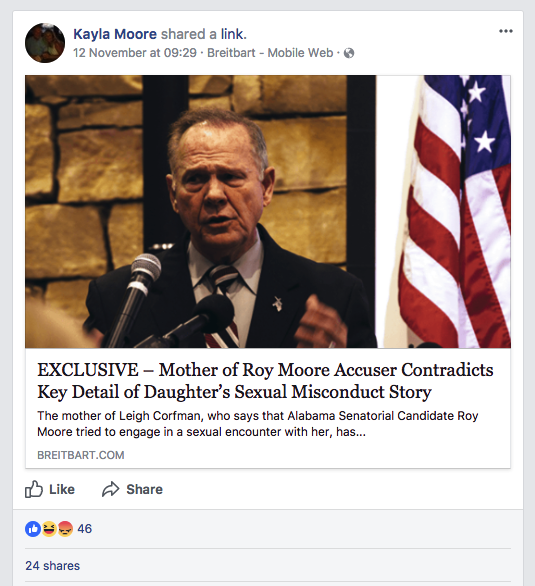 Kayla Moore, whose husband Roy Moore has been accused of sexual misconduct by five women, is sharing misinformation about the accusations on her Facebook page. Beverly Young Nelson was the latest woman to come forward against Roy Moore. During a press conference on Monday, she said the Republican Senate nominee sexually assaulted her when she was 16 years old. She's joined four other women who have alleged Moore pursued them when they were between 14 and 18 years old. Moore has denied all allegations. Almost immediately after the women came forward, misinformation began spreading about the accusations. A since-deleted Twitter account, @umpire43, baselessly tweeted that the Washington Post was offering to pay for accusations against Moore. It provided no evidence and the account itself was unreliable. Aside from spreading other false conspiracies, it was impersonating a dead SEAL, the Daily Beast reported. Moore’s wife then seemed to nod to the unfounded conspiracy on her Facebook page. Moore’s campaign shared the post. According to social tracking tool BuzzSumo, Gateway Pundit's article received more than 7,500 likes, shares, and comments on Facebook by Friday and nearly 28,000 by Monday. People shared the article 4,000 times on Twitter by Friday, which more than doubled to 8,600 by Monday. 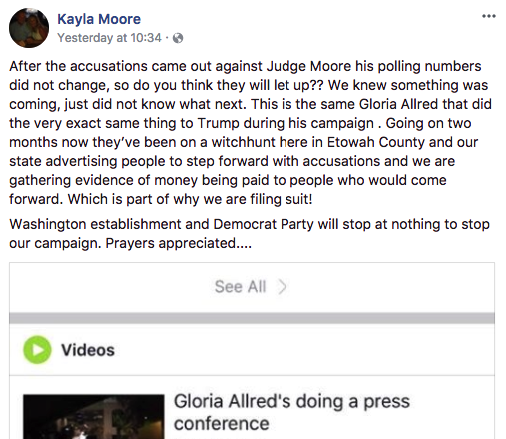 Kayla Moore claimed that she and others were “gathering evidence of money being paid to people who would come forward” in preparation for a lawsuit. Roy Moore made a similar claim in an interview with Sean Hannity on Friday. Neither he nor his wife has provided evidence. Kayla Moore did not respond to BuzzFeed's requests for comment. After Beverly Young Nelson came forward with allegations against the Senate nominee, Kayla Moore shared another Gateway Pundit article that baselessly attacked Nelson. This Gateway Pundit article was also based on a tweet, but this time from a real person, Thomas Wictor. 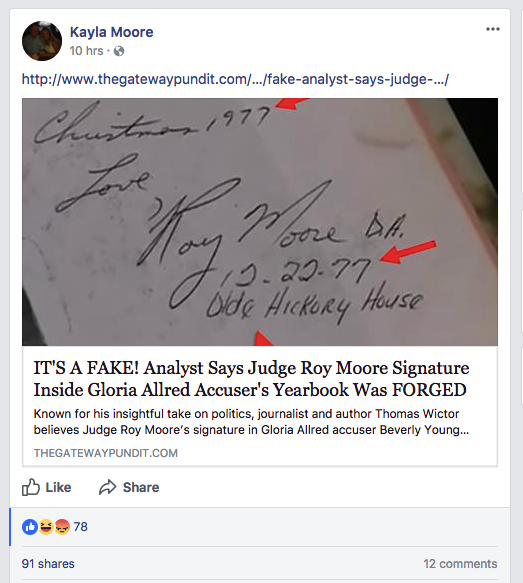 He claimed the signature Roy Moore allegedly left in Nelson's yearbook was fake, but Wictor has spread conspiracy theories in the past and has no qualifications that would allow him to accurately analyze Moore's signature. Wictor didn't respond to BuzzFeed's request for comment. His theory that got the most attention was an unfounded conspiracy about a photograph of two Palestinian men in a hospital crying over the death of their father. Wictor's theory that the photos were faked was widely debunked and rebuked in 2014 after it got a boost from conservative writer David Frum. In the case of the yearbook signature, Wictor did not provide any concrete evidence or documentation of the signature being fake. The Gateway Pundit article doesn't cite any other source on the yearbook signature. It has nearly 40,000 likes, shares, and comments on Facebook and over 14,000 engagements on Twitter according to BuzzSumo. But that wasn’t the only piece of misinformation Moore shared on her Facebook page. She also posted a Breitbart article with a misleading headline. The Breitbart article didn't contain other new information or contradictions, but treated this detail as damning evidence against Corfman's allegations. Still, Kayla Moore posted the article on her Facebook timeline without comment. 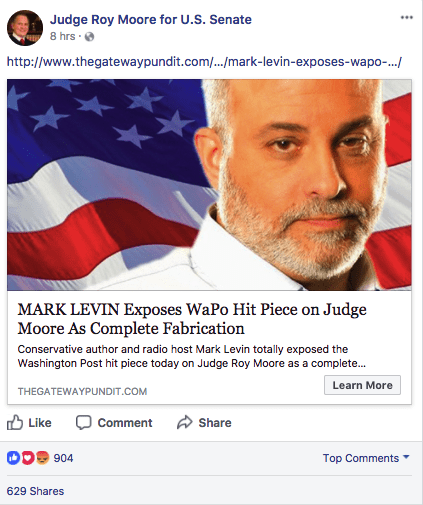 Moore’s official Senate campaign Facebook page also shared a Gateway Pundit article that claimed to discredit the Post’s reporting as a “complete fabrication,” but did not provide any evidence. The Gateway Pundit article is based on a Nov. 9 episode of a conservative talk radio program, the Mark Levin Show. The description of the episode claims, “The Post was fed this information by someone or some group,” but offers no proof to back this up. In the wake of the allegations against Roy Moore, many online commentators have been working to sow doubt against the accusers. Alex Jones, who heads the conspiracy website InfoWars, initially dismissed the allegations against Moore and pushed the fake Washington Post narrative. 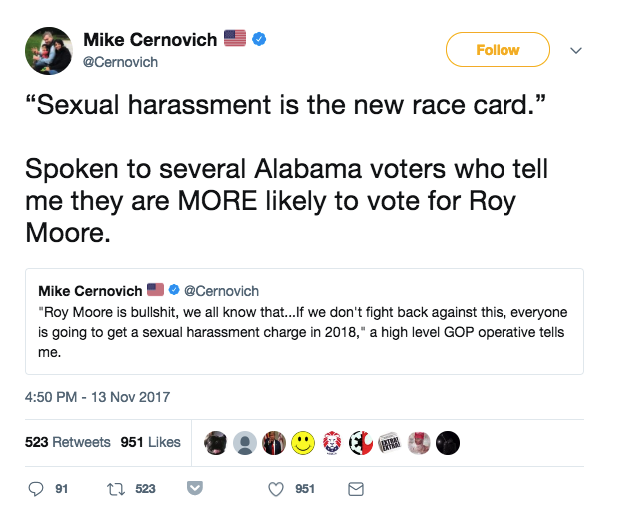 Another pro-Trump twitter personality, Mike Cernovich, also continuously cast doubt on the accusations and threatened to go to Alabama himself to investigate. The Gateway Pundit and other publications have been actively posting about many conspiracies on the topic without verifying facts. —Blake Montgomery contributed additional reporting to this story.